Finding the right roofing and remodeling contractor for your home renovating needs is critical when it relates to the functionality and aesthetics of your home. For more than a decade, BRY-JO, with its personalized service, is proud to have touched the lives of thousands of homeowners, helping customers make choices based on the current real estate market and resale value created through trustworthy client experiences. Leave the planning, design and remodeling to us, as we work closely with you throughout the design process to assure that your home is as beautiful as you dreamed it could be. 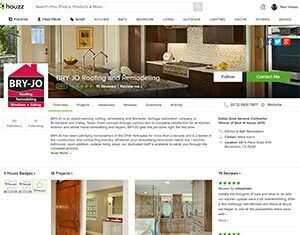 Through communication and collaboration, BRY-JO takes the time to understand our customer’s needs and provides a personalized process for each unique home remodeling project. Let BRY-JO make your home remodeling dreams a reality. Also, don’t forget, our competency in residential roofing is where we started, and it remains an integral part of BRY-JO’s skill set today. Expectations. From budget and time constraints to construction flexibility, at BRY-JO we understand the commitment to take on an extensive home remodeling project. You can rest assured that at BRY-JO we will meet and exceed your expectations on any home remodeling project. BRY-JO is committed to custom, high-end renovation projects that require attention to detail and a skill set that is unmatched in the Dallas Metroplex area. Our team of dedicated roofing and home remodeling contractors bring professionalism and integrity to every home project we do. Our general contracting team works with all trades across all disciplines, ensuring every aspect of the project is done to BRY-JO standards and the expectations of the homeowner. Whether working with electricians, carpenters or drywall professionals, for example, our team coordinates with its subcontractors for quality assurance and on-time performance. We are a full service roofing and remodeling contractor and choose to work on projects that require us to use multiple trades on each project. For example, if you want to just change the flooring, we may not be the best fit for each other. Contact us today to discuss your project and to learn more about how we can best serve you.